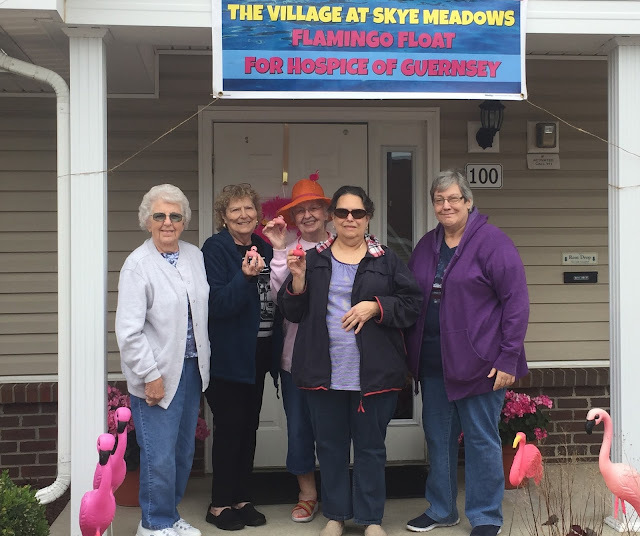 The Village at Skye Meadows hosted the 4th annual Flamingo Float benefit for Hospice of Guernsey on Friday, September 1, 2017. Residents raised a grand total of $1,039.18 by selling tickets to sponsor a Flamingo. Eloise Eschbaugh was the top ticket seller by raising $500.00. For her efforts, Ms. Eschbaugh received a $50.00 gift card to Wal-Mart. The winners of the prize money were $100 Bob Radtka, $50 Robin Eschbaugh and $25 Laurie Caplinger. The Village at Skye Meadows is located at 6533 Fairdale Drive, Cambridge, and is a property managed by Cambridge Management Corporation. For more information about their homes and apartments, please call 740.439.0414.